We have a leash law in our town. This means that, on our walks, Tucker is on his leash. Every. Single. Day. I don't have a problem with the leash law at all. Even if we didn't have one here, Tucker would still be walked on one for safety reasons if nothing else (even though the subdivision where we walk is undeveloped--and we hope and hope it remains that way). What I DO have problems with are all the dog owners who walk their dogs without their leashes and the fact that the leash law itself seems to be discretionary. I know that there are some other walkers out there who have called and lodged complaints with the Police Department (from the officer who sends out crime reports for the town). I have seen an increase in patrol cars in the area as well as animal control. What I have yet to see is anyone walking with unleashed doggies being ticketed. This morning AnimalControlMan was in there and TWO patrol cars. There were 5 unleashed dogs with their owners walking around. AnimalControlGuy stopped only one person (she has two dogs and one of them is mean---I know this because that's the dog that attacked Tucker Sunday morning) and merely talked to her. She waited until she thought he left and CONTINUED TO WALK HER DOGS- UNLEASHED. AnimalControlGuy meandered his vehicle around the loop again but stopped to talk to the officers in the 2 patrol cars parked in the back of the subdivision. Mean Lady with mean dog, meanwhile, moved to the inner loop that surrounds the 2 ponds and CONTINUED TO WALK HER DOGS- UNLEASHED. Maybe AnimalControlGuy couldn't see her, you say? Well, I could see her and I had practically the same vantage point as he did. This probably sounds like I am nit-picking and, I must admit, MOST of the unleashed dogs are very, very sweet and so are their owners (and, when the dogs jump into the ponds, the birds take off and I get pictures of them in flight--this also has a down side which is the fact that the dogs frighten the birds which is why they take flight) . However- there IS a leash law and some of the dogs are not easily controlled by their owners. I have seen 2 different dogs almost get hit by cars when said dogs darted into the road. I have seen 1 large dog jump up on the older lady who uses a walker but gets out there and walks anyway. I have seen 3 different dogs get leashed as soon as another person and/or dog comes close to them (which makes me wonder what would happen should they not get the leash on them in time). I have seen Tucker get attacked by a dog (and there was no blood, I think the dog was just doing that alpha male thing, but STILL). I have seen 2 dogs who run up to other people and/or dogs at full speed and loud bark. I have seen several police cars and animal control vehicles cruise through the area and DO NOTHING which leads to my thinking that the leash law is discretionary so WHY DO WE BOTHER HAVING IT? AND, did I mention that there is a DOG PARK not even a half mile from this place????? So fellow pet owners out there-please share your take on the leash law where you live. Meanwhile, here are some photos from the week's walks. Beautiful pics ... btw people who don't pick up after their kids annoy me just as much as those who don't pick up after their dogs. I am a fellow empty nester. I have been for a few years and just when I start getting used to it they come back then leave again and I go through it all over again. I'm looking forward to reading more of your blog. Thank you for following me......I'm your new follower too! Looing forward to getting to know you! Thank you all so much for the kind comments and for following me. I love making these connections and getting to know such amazing women! This may not help you feel any better, but we have large fields where I take my dogs so they can run and wander off-lead. It is wonderful! But if I did live in town, I would definitely, DEFINITELY have my dog on a lead when walking with him/them. I have heard of too many dogs being attacked by other dogs. They should be on a lead for sure. I think our little village has a leash law, but I see many who ignore it. they're asking for trouble. That's a absolutely well written and beautiful post. Way ta go girlfriend! You must have a really good camera. I'm going to ask Santa for a good one. Hmmmm Really wanted a laptop though. Oh well, we'll let Santa make my choice. ~hehe~ Have a wonderful weekend. Love the red leaves on your wall. So pretty! We have a corgi who when he walks (always on a leash) alone is great with other dogs but if I have the kids with me while he's walking is a super territorial dog. There are a LOT of unleashed dogs in our neighbourhood and my dog has defended the kids before and I make no apologies for it when the owners of other dogs come to retrieve their unleashed dogs after my dog snaps at them. By ignoring the bylaws these people are putting their dogs at risk, and I certainly have NO problem telling people this, nor do I have any problem praising my dog when he protects my kids from a dog that runs up to us barking. I think these dog walkers are being totally irresponsible, and are putting far too much trust in animals to have a conscience. Just sayin'!!! Here from FFF, hope you're having a super weekend! Why do people have to break the law. It doesn't make any sense to me. Dogs should be on a leash for several reasons. (they most likely don't pick up the poop either!) But if something happened to their dog while unleashed they would be the first ones to sue someone! Thanks for visiting and following my blog. Im following back. Have a great weekend. I am right there with you sister on the leash laws! What drives me nuts is when the owner says "oh its ok he/she doesn't bite"... are ya kidding if it has teeth it bites. It's just common courtesy, not everyone feels comfortable (like me) walking by an unleashed dog! Thanks so much for stopping by my blog and becoming a follower. I'm following you back. Couldn't believe your post today because I was just ranting on facebook about this very thing. I have two dogs and they are always leashed unless they are in my fenced backyard - for their own safety! There are too many trucks/speeding cars, coyotes, etc. out there for me to risk them running loose. 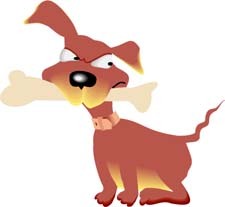 But today, I was trying to walk my dogs (on leash at our shop property) and suddenly this huge unfixed male dog arrived from somewhere and started trying to attack my little Jack Russell! It was horrible. My black lab was being very friendly with the strange dog but my Jack Russell went crazy. I had to grab her up off the ground and try to get her calm while being twisted around by their leashes as this large dog tried to dart past my lab to get at my Jack Russell. Not fun at all. Apparently we have a new neighbour. I talked to her and feels that they moved out into the country so their dog (a Great Dane/Mastiff cross!) can run loose and free. Well, that is just ridiculous! There is a 6 lane highway 1 km from us and all kinds of access roads right beside us so it is simply NOT safe for people to let their dogs run loose and it's not fair to the rest of us neighbours either. Thank you so much for stopping by my blog and saying hi! I enjoyed your comments! Thank you! I am now your newest follower. It's good to know that I'm not alone in my leash law issues! Maybe I'll get bold enough to say something directly to them one day...when I think they won't sic their unleashed dogs on me! LOL Thanks to everyone for stopping by, giving such nice comments and honest opinions, and for following! I think you have a legit complaint. I would certainly make a complaint about the lax-ness of the animal control people. Maybe the mayor would be interested. Certainly the manager of the animal control division. We have a similar problem - our neighbors let their dog roam the neighborhood at all hours of the night & day. She poops in our yard (never cleaned up, at least not by them! ), chases our cats, and barks at our kids, and several times has almost caused car accidents. We have asked nicely, complained, threatened, called animal control, and it's gotten a bit less infrequent, but still happens at least once a week. I just wonder what world these people live in that they could be so thoughtless of their neighbors and their pet? Otherwise, they seem like pretty nice people. Bizarre! Hope you get lots of followers from it! Including me!! I love your blog too! Be sure to come by tonight for the Meet Me On Monday Blog Hop! Wow! Some people are just so irresponsible! I would never take my 2 little terriers out without their leashes for their own safety. Luckily we have a very large wooded yard that is fenced in and they can run free (safely; most of the time). I do not even know if we have a leash law in my town but thank goodness everyone here leashes and cleans up after their pets. We have one neighbor that lets their cat wander and I worry about the poor cat but she does stick pretty close to her home. Thank you for following me from Over 40; I am now following you. I think you are doing pretty well with the empty nest; I cried for the first year! Thanks for stopping by and leaving a comment. I'm not quite to the empty nest stage, but most days I'm really looking forward to it! I hate seeing dogs run loose, as there is always the possibility they'll get hurt. But it is also so great to see them running free and having a great time. That's why everyone should have an off-leash dog park near by. I'm following! Thank you for visiting my blog! I'm following yours now too. Your bird pics are wonderful! I love the wildlife - great pictures!